So, you’ve finally managed to create your new theme in Magento 2. After a few hours of swearing and sweating, you’ve successfully created all necessary files, defined fallback to Luma (you can blame Luma for all the mess that will happen later on), registered your theme within the system, activated it in the Magento Administration…aaaand…you are ready to go! We’ve all been reading about the new changes that will happen in Magento 2 frontend. Everyone was talking about speed, new technologies that we’ll be able to see in new edition. Platform was in development phase, things were changing from release to release…and, of course, no one was really thinking about first questions that start to show up after you really start to work on your first Magento 2 project. Soon I realized that, regardless of what I already know about all the new stuff and how to work with them, I was really absolutely clueless on how to begin with work, how to set up and organize everything properly. Yes, we had official documentation but for me it was confusing and some things weren’t clearly explained. In this article, I will show you everything I did during my work on the first Magento 2 project. There may be better solutions than mine and I hope you will write them down in comments! I presume you know about CLI commands for Magento 2. We will use some of them to work with static files and compiling. If you don’t know which one to use and when, here’s the list of all commands with description. I created new theme in new Vendor package, fallback was set to Luma theme. Livereload to inject changes in browser. 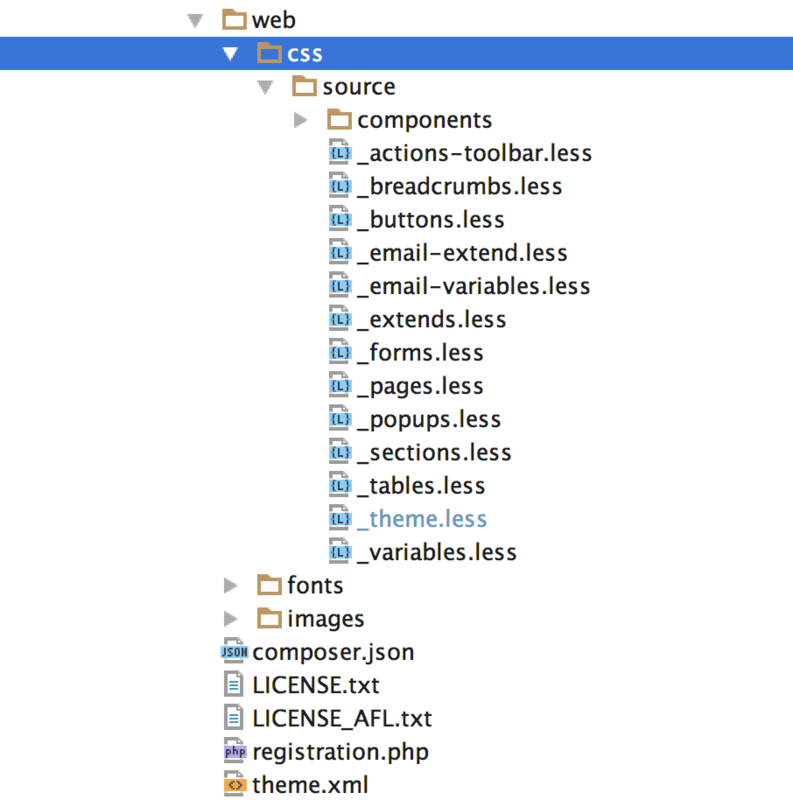 Structure is totally different than in Magento 1, LESS files can be found on multiple places. 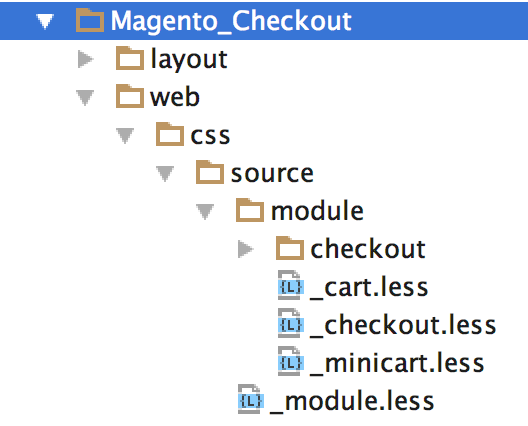 As you can see, LESS files for Magento checkout module are stored inside “Blank” theme, not “Luma”. If you don’t see LESS files in module folders inside “Luma” theme, you know that they can be found in “Blank” theme. Like we will override/extend some “Luma” LESS files for our newly created theme, “Luma” does the same to “Blank” theme – it inherits some of the styles and overrides others. Magento 2 comes with UI library that was built to help Front end developers deal with common tasks. It employs a set of mixins for base elements to ease Front end theme development and customization. So, we have theme-related LESS files, module-related LESS files and LESS UI library. After we are familiar with the structure, it is time to start with the real work. First thing first – we need to deploy static files that will be served to the client. This command will generate static files for your theme and also, symlinks to corresponding LESS files. Symlinks are basically symbolic links to your actual LESS files that are placed inside your theme (or fallback theme). So , when you edit LESS file in your theme, changes will be automatically applied to the symlinked file stored in pub/static folder. If you don’t get why is that so important, think about cleaning and deploying your static files after every change in LESS files. Symlinks are also good for tracing and debugging. If your LESS files icon has small arrow that points to top right, you know that file is symlinked. Hovering over symlinked file will reveal real location of file that is stored in your theme (or fallback theme, or “lib” folder :)). OK, we have successfully deployed static files which are symlinked. That means we are ready for styling! After adding new LESS files, you must deploy static content again. to remove all static files. to create new static files. 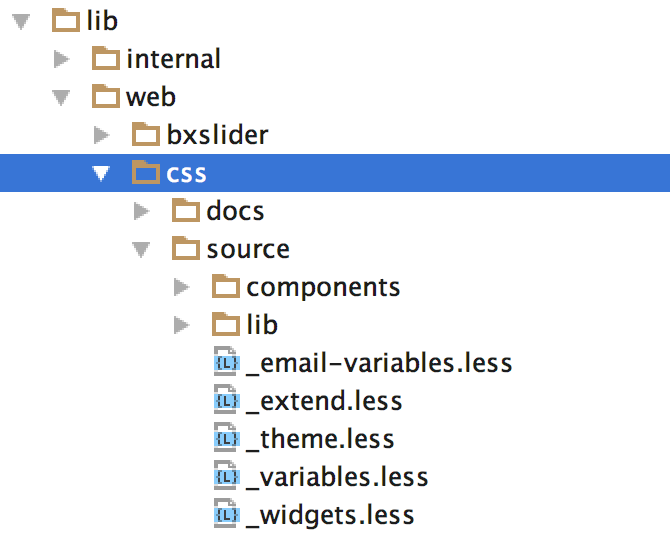 Now, you can write your own CSS inside that file and changes will be applied to your theme! that tracks the changes in the source files, recompiles .css files, and reloads the page in the browser pages (you need to have LiveReload installed for you browser). Similar approach as with extending your theme but difference is that we use exact LESS filename in order to override file in parent theme. Again, clean and generate your static files. Again, don’t forget to clean and generate your static files. As I mentioned above, module-related LESS files are located inside Module folder. What if I like default styling of a certain module but I want to add some of my own CSS, just like I did with _extend.less for my theme? Clean static files, deploy new ones and you can write your css inside newly created _extend.less. HINT: the best way to check if you properly extended theme or module files is to hover over Symlinked LESS file inside “pub/static” and see what is the real location of file. If your file is located in “blank” or “luma” theme, you did something wrong. I think that now you are pretty much familiar with the process so I’ll keep it simple. 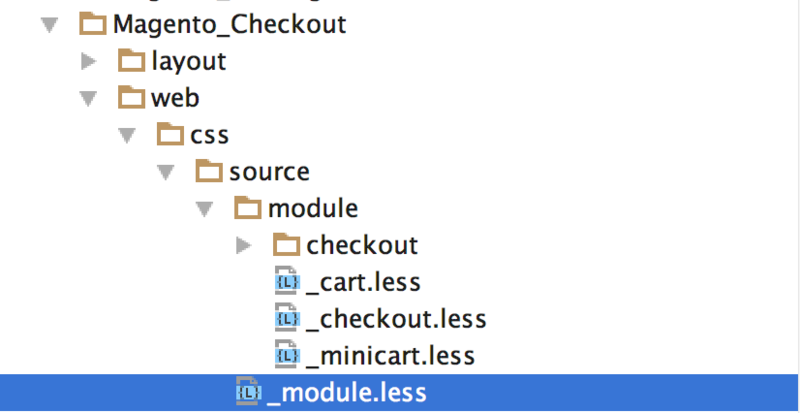 I created _Module.less inside my “Magento Checkout” folder and by doing that, I override parent theme module.less. Inside “module.less” I have @import directives for those 3 files that you see inside “module” folder. Now I have full control of what will be loaded and I can easily remove, for example, “checkout.less” and/or add my own less file/s. And then, inside _extend.less file, register that file with @import directive. Of course there are much more on this topic but those basic actions we went through will help you kickoff with your project. However, if this or anything else regarding Magento development confuses you, we will gladly check out your site and offer technical insights on what to improve based on our detailed custom report. Feel free to get in touch! hi, how to change the css for the homepage/landingpage. I actually decided to not use “lib” folder in my custom theme. It just got so confusing having it (note Luma doesn’t use it either) due to deciding if a file extends directly UI library or not, etc… Rather, I just keep all my _extend.less files in css/source/*. Is this not a good idea? I should be seeing some color change to the header background, correct? . Can anyone help? thanks. Thank you very much for shedding some light in my begginer path with Magento 2. I’m used to work directly in css using chrome to test changes, and then directly apply it to the css file mentioned in the debug window. I’m using prestashop 1.6 in my current shop, but I’m willing to do my new shop with Magento. Is it possible to temporrarly pass/load the source file reference directly to browser? This way I could live test the changes more easly. okok I can extend quite everything but… what if I would like to extend web/css/source/module/minicart.less? I’m using _extend.less to override the parent theme’s style. But I find that I have to use !important everywhere. Am I doing something wrong? 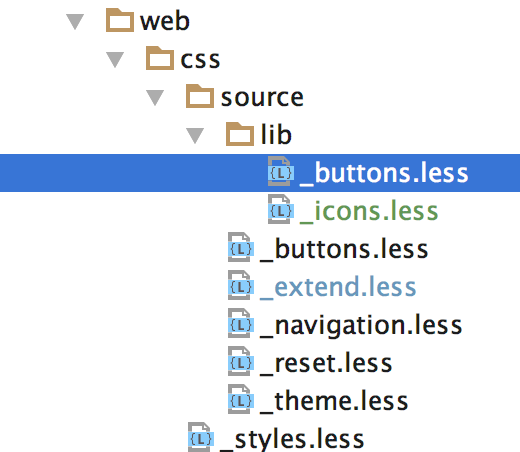 to override the parent’s styles, you don’t have to extend anything. The fact you can find an extends in the web source of the blank theme, for instance, it’s just because, i guess, they’re all plural in that folder: _extends, _forms, _icons… yes, it’s kinda confused! you can overwrite the variable @button-primary__background in your custom theme. Go to _theme.less which should be located unter Source/app/design/frontend///web/css/source/ and assign your color to it. As Luma is a demonstration theme, it is recommended to not use it as a parent theme. Blank theme is the best choice to base your new theme on. That was awesome article, i got few confusions how to define custom media queries like orientation and max and min together, provided doc in CSS folder has no topic like this. Thanks ! Very informative, please do keep sharing information regarding Magento2. Great article! I just started working with Magento 2 a week ago and this article comes in just the right time to confirm my knowledge. I struggle however with how to display images via CSS. For example I want a new background image. Should I store it inside //web/images or inside //Magento_Theme/web/images? How do I link an image from either of those two locations? I stored my images in “/Magento2/app/design/frontend/Vendor/YourTheme/web/images”.